Description: Violin Concerto, Op.53 (Dvořák, Antonín); Antonín Dvořák was a Czech composer during the Romantic period; Piecestyle: Romantic; Instrumentation: Violin solo and Orchestra :2 flutes, 2 oboes, 2 clarinets, 2 bassoons,4 horns, 2 trumpets, timpani, strings; The score was first preformed in 1883-10-14 in Prague (2nd version); The score was dedicated to Joseph Joachim; Opus/Catalogue Number: 1st version, B.96 2nd version, Opus 53, B.108; Key: A minor; Number of Movements: 3 movements 2nd version (B.108) : I. Allegro ma non troppo: II. Adagio ma non troppo: III. 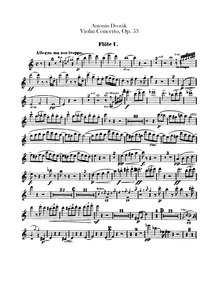 Allegro giocoso, ma non troppo; Concertos|For violin, orchestra|Scores featuring the violin|Scores featuring the orchestra|For orchestra with soloists.